Just another minimal blue and whit flat UI kit for web/mobile design. Including video player, weather widget, user profile, statistics, calendar, map, login form, and much more. 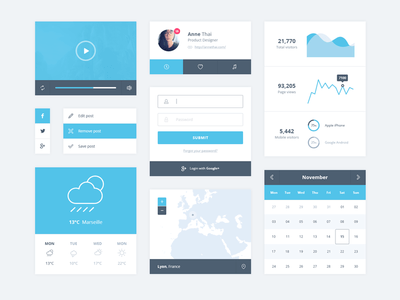 Minimal Flat UI Kit PSD for you to download and use in your next web design or graphic design project, created by vt.